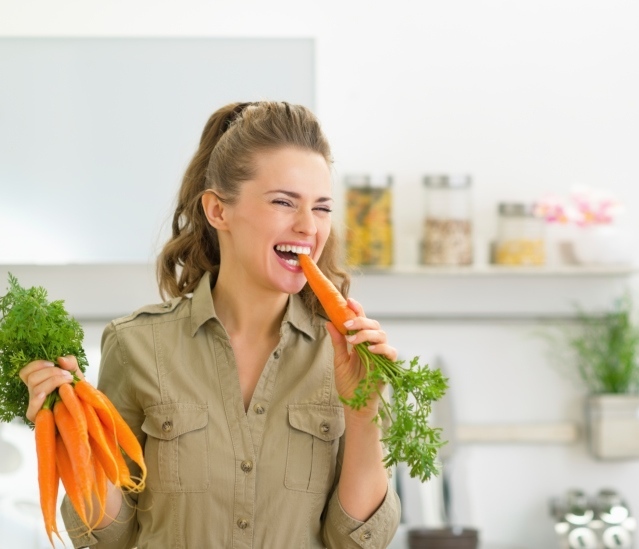 A new study published in the journal JAMA Ophthalmology confirms that carrots provide sufficient eye health. The researchers used health surveys to gather and analyze data on individuals 50 years old or older from 1984 or 1986 until 2010. Of the participants involved, 63,000 were female and approximately 39,000 were male. All participants were employed in healthcare professions with the majority being nurses. The results? Of the 104,000 participants involved, 2.5% of the participants developed intermediate or advanced forms of macular degeneration at some point during the study. Additionally, Wu’s team found that those who ate high levels of the carotenoids lutein and zeaxanthin saw a 40% reduced risk of developing an advanced form of age-related macular degeneration when compared to those who consumed the least. Further still, the researchers noted that participants who consumed the highest amount of other carotenoids, including cryptoxanthin, alpha carotene, and beta carotene, had a 25%–35% lower risk of developing an advanced form of macular degeneration. What the researchers did not find was a connection between carotenoids and intermediate forms of macular degeneration. Age-related macular degeneration is a common cause of vision loss, especially among the elderly demographic. It affects the center area of the retina, called the macula, and leads to a sharp decline in the central vision. Macular degeneration can cause blindness. Commenting on the question of whether carotenoid supplements would have the same or similar impact on one’s risk of developing the eye condition, Dr. Paul Bernstein, a professor of ophthalmology and visual sciences at the University of Utah, School of Medicine noted that he often recommends nutritional supplements to those with intermediate and advanced forms of macular degeneration, but it has not been proven if these supplements help those who are at risk of the condition. In addition, Dr. Bernstein points out some weaknesses in this new study that could lead to a bias. For instance, because the study analyzed data gathered through surveys, the findings rest on people’s recollections of their diets, which is inherently inaccurate. For more accurate data, researchers may examine the levels of the carotenoids in participants’ bodies and eyes in future studies. Having said that, Dr. Bernstein does recommend maintaining a diet high in fruits and vegetables, especially colorful vegetables, to help prevent macular degeneration. Dotinga, R. “Carrots Do Help Aging Eyes, Study Shows,” MedicineNet.com web site, October 8, 2015; http://www.medicinenet.com/script/main/art.asp?articlekey=191124.